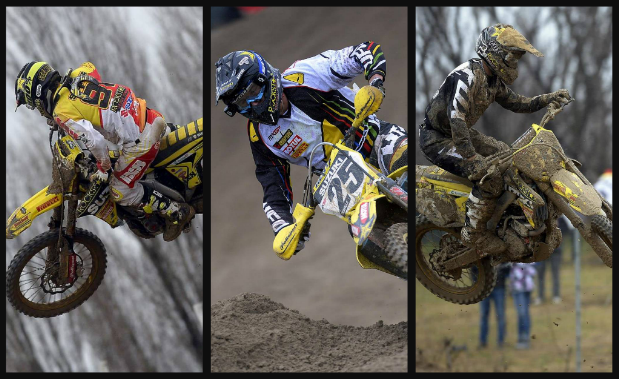 Team Suzuki Press Office – February 23. Rockstar Energy Suzuki World MXGP rider Clement Desalle won all three races at Sunday’s Mantova Starcross International motocross in Italy. The 25-year-old Belgian, coming back from a wrist injury, showed that he's on the pace for the 2015 MXGP season opener next weekend in Doha, Qatar – and following his second position at the Hawkstone Park and a double-race victory in the Valence Internationals in the UK and France over the past two weekends. Today’s event, in northern Italy, was run as a three-heat format where MXGP and MX2 classes raced together. Desalle and his RM-Z450 were quickest out of the gate all weekend, taking first position from the start and leading from start-to-finish, followed by Evgeny Bobryshev (Honda). Rockstar Energy Suzuki Europe's Jeremy Seewer and Junior World 125cc Champion Brian Hsu had to work their Suzuki RM-Z250s hard on the sandy track. Although slightly out-powered by the 450s, Seewer managed to gain places which led him to the podium with second overall thanks to 9-4-9 positions. Team-mate Hsu was coming to terms with the speed and power of the RM-Z250 and a strong fifth-placed finish on Saturday's qualifying race proved difficult to repeat in Sunday's events with several small errors slowing him down. His end result of 30-26-13 gave him 15th overall in the MX2 ranking. Desalle's Suzuki MXGP team-mate Glenn Coldenhoff had to skip this race due to two broken big toes (outer knuckle), sustained during a practice session; and Kevin Strijbos opted to sit-out the race on doctors' advice, to allow additional rest for the tendonitis in his wrist. The team now heads-back to its Belgian headquarters to do final preparations for the first Grand Prix on February 28th. All riders, including Strijbos and Coldenhoff are scheduled to set-off to the event on Wednesday to acclimatize to the hot and humid conditions. MX1 Overall : 1. Clement Desalle (Rockstar Energy Suzuki World MXGP) 75pts. 2. Evgeny Bobryshev (Honda) 66pts. 3. Ceriel Klein Kromhoff (KTM) 55pts. 4. Kristian Whatley (Honda) 54pts. 5. Gert Krestinov (Honda) 48pts. MX2 Overall: 1. Jordi Tixier (Kawasaki) 72pts. 2. Jeremy Seewer (Rockstar Energy Suzuki Europe) 63 pts. 3. Brian Rogers (KTM) 58pts. 4. Jens Getteman (Honda) 53pts. 5. Robert Just (KTM) 39pts. 15. Brian Hsu (Rockstar Energy Suzuki Europe) 23pts.